New Delhi: PresidenT Ram Nath Kovind, addressed a function in Mhow (Madhya Pradesh) today (April 14, 2018) on the 127th birth anniversary of Babasaheb Dr BR Ambedkar. Earlier he paid tributes to Dr Ambedkar at his memorial in Mhow. In doing so President Kovind became the first President of India to pay homage to Dr Ambedkar at his birthplace (Mhow) on his birth anniversary. Addressing the gathering, the President said that the greatest contribution of the Constitution of India, created under the guidance of Dr Ambedkar, was to make all Indians equal citizens, irrespective of social or economic background. This Fundamental Right ensured that every Indian has the right to a dignified life. In parallel, the Constitution introduced universal franchise and gave every citizen, irrespective of social background or economic status, the right to vote. 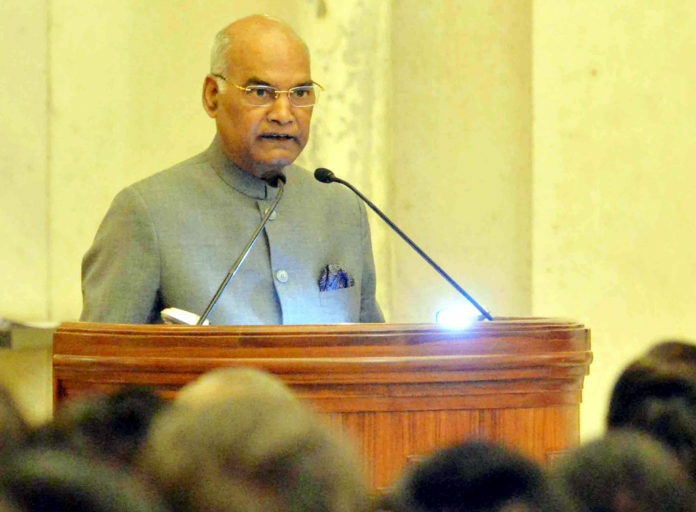 These two rights, President Kovind said, have special significance for the poor, the traditionally disadvantaged and the weaker sections of our society. These rights, along with the importance of education that Dr Ambedkar underlined, are crucial for the proper exercise of all other rights granted to citizens by our Constitution. Our country is run on democratic traditions – elections are held, governments are formed, and the future of citizens is worked towards. There is need for people to be aware of challenges and opportunities – and to exercise their democratic rights wisely. The President said that in his move towards building a better and fairer society, Dr Ambedkar emphasised the values of nonviolence and of compassion in public life. He fought for welfare of weaker sections of society but his path remained nonviolent – stressing consensus through dialogue. He believed that this was our country, for all of us, and that whatever needed to be done to bring justice to the weaker sections of society could be achieved by adhering to social harmony. In his final speech in the Constituent Assembly, Dr Ambedkar said now that we have constitutional methods of expressing opposition, we should avoid disruptive mechanisms. The President said our Constitution is our sacred text. It empowers those from traditionally weaker and disadvantaged sections to aspire to and reach the highest positions in the country. It is a tribute to Dr Ambedkar’s efforts that today people from such sections are making important contributions to building a modern and better India. The President said Dr Ambedkar often stressed that being an Indian was his primary, secondary and ultimate identity. Today, there is need for every citizen to internalise this sentiment. Equality and fraternity create harmony. As such, all citizens, especially young people, should follow the path of fraternity that Dr Ambedkar showed us.